Fish Spa - Be Glossy In and Out! 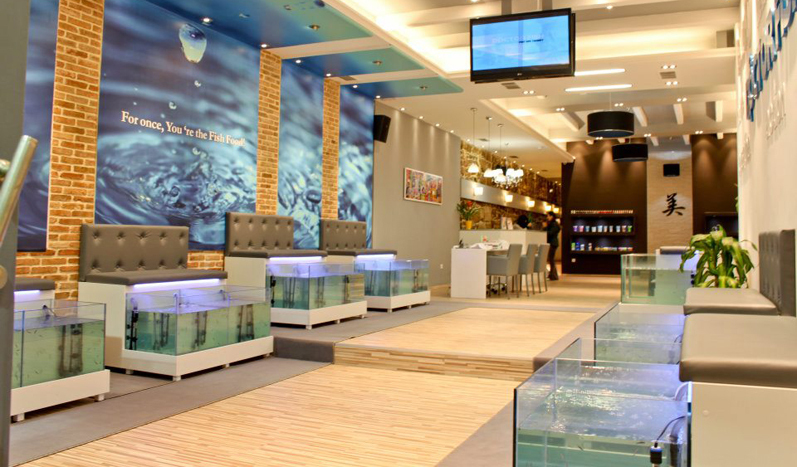 Fish Spa is another kind of spa, a natural and unconventional method of making your pedicure or manicure. It is very popular in Greece, Turkey and Japan. It is both therapy and cosmetic method of removing the dead skin through pinching of Gara Rufa fishes. These fishes are touching only the dead skin, never the healthy skin, so it doesn,t represent any danger, mostly that they don,t have teeth. After the therapy, your skin will be left very soft. They look a little dangerous, but they are harmless. It says they can cure eczema and psoriasis. They can be used for cleaning the teeth also. In some countries it is a controversy procedure, in the USA it was forbidden due to unhygienic aquariums. I believe there are no risks if the aquariums are sterilized and water changed after every use. Would you try this funny and pleasant way of making your mani/pedi? It's nice and funny. Μιλάς ελληνικά? Nai, ki egw sthn Athina menw. Asxoloumai me makigiaz. Me xafniase pou eida sth selida sou ellhnika giati grafeis roumanika. Nai einai alithia, to blog moy einai geia roymanes:)) Ma egw eimai sthn Athina, sthn Kallithea xexexe:)) Xairomai poy se gnorisa!! Axxxx na moy peis pws einai to makiaz moy epiedh eimai sthn arxh me ayto:)) Egw asxoloumai me thn aisthitikh prosopoy kai swmatos.